In case you missed it,, here's part one. I can't see them here either, but can by clicking on the Flickr image and can view all there........Craig should give sleeping through anything lessons! Cute kitties, cute husband, new pillows!! Should be working now.... I don't know why flickr does that. 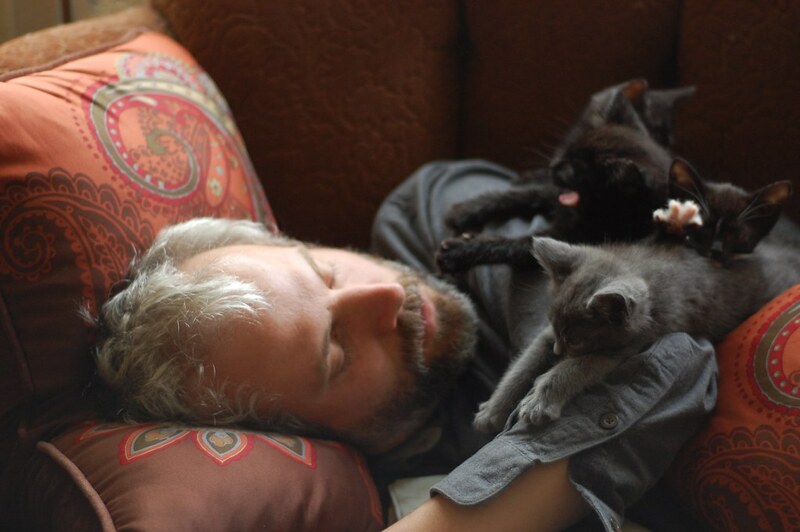 Ahh, what is better than an afternoon on the couch covered in Kitties? I ask you... really. LOVE! the second picture with the yawn and the spread toes!!! Patti, Teensy yawn *and* starfish toes = the BEST cat nap I've seen in awhile! and where is th Bean when all this group napping is going on? I'm melllllllllllllllllting! Honestly, does it get any cuter? Wow, I remember seeing part one but I completely missed Craig in that shot the first time. 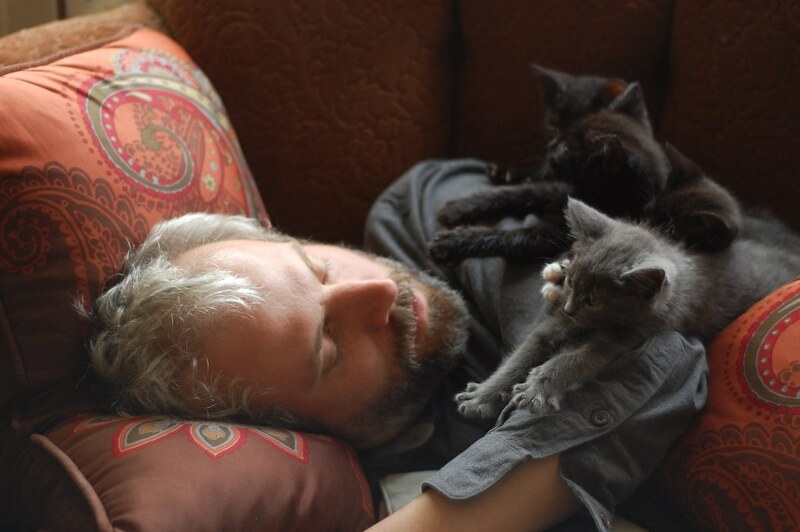 I agree, his secret talent must be "naps with kittens" - sorta like "dances with wolves" but way cuter! Did you put them up there or do they climb up there on their own? I know my kitties will usually not climb up when I ask them to so that I can get in a really good nap but I always wake up with one on my legs and the other draped around my neck. Coco's Mom... you never have to invite these kittens. They love to pile on people. 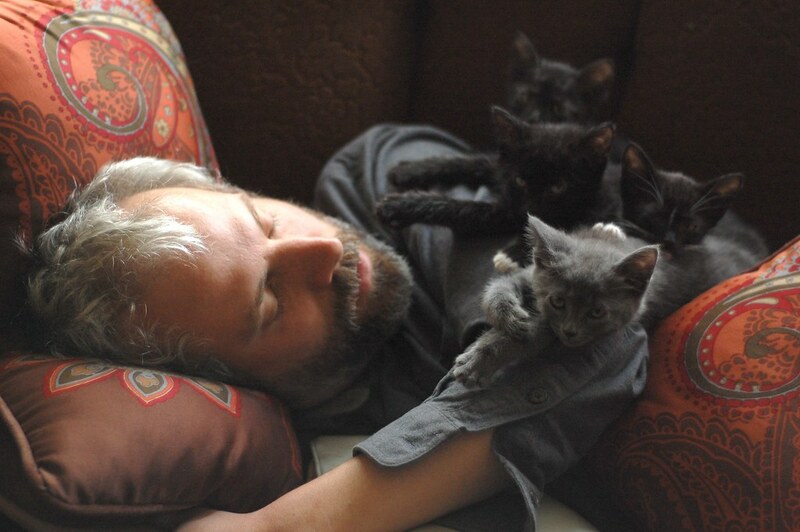 Oh to be Craig under a pile of kittens! Jealous! Oh how sweet. There's nuffin better than being on top of one of yoor favourite beans! One of the best naps ever! Adorable! That stretched-out paw is deadly! Love the little white sock with pink toesies. Sooo cute! Ouch, Ooof, Yow. That's me trying to take a nap with 18 pound Kodiak jumping up and landing on my stomach to join me in some zzzzz's. I thought it was cute when he was a kitten, now I can't break him of the habit. Move over and stop hogging the blanket! 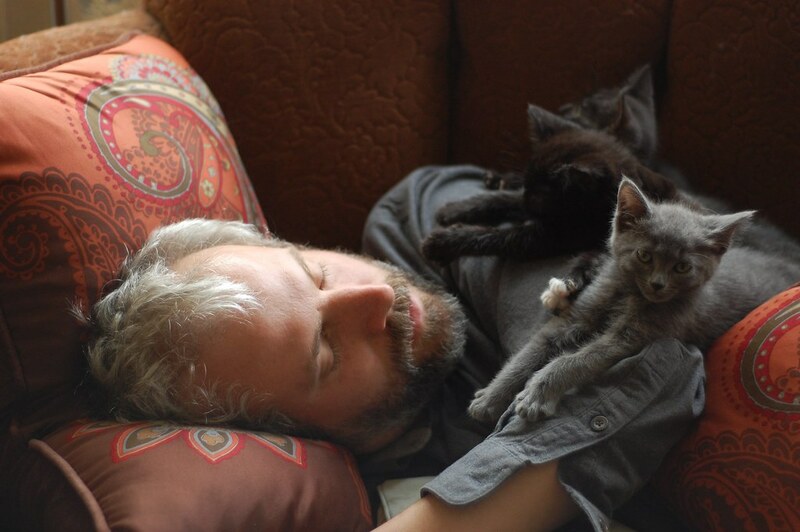 Ooh I am so jealous...I want to be napping with some kittens now. My first kitty use to sleep on my chest but she was only 9 lbs and this was only during the wintertime. Not only the splayed toes from the kitties with white mitts but it's the little pink tongue in the 2nd photo that slayed me. Study in black and silver amongst dark red pillows! Very nice. Oh, and ditto on the tiny toes - they kill me! Laurie, how about a calendar next year? 12 months of handsome men napping with kittens. Sure to be a bestseller! Same nap or different nap? I hope Craig lets you have a little kitten nap time, or does he hog it all himself? I don't blame him if he does!